Julius Caesar’s stepping stones : Alesia – Celtic relief force attacks the outer ring of the Roman besiegers camp. 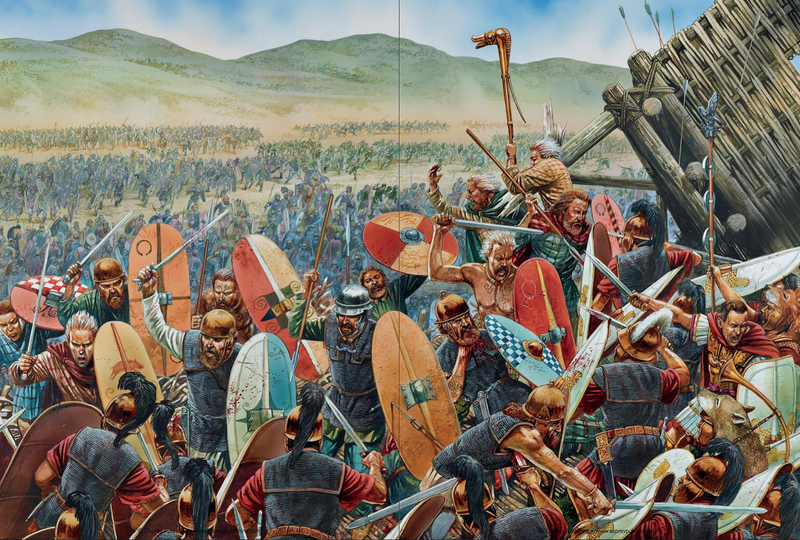 The Battle of Alesia in 52 BCE was the final conflict that determined whether the Roman or the Celtic way of life would dominate northern Europe. It was the culmination of the five-year conquest of Gaul (France, Belgium, Denmark, and Luxembourg) by Gaius Julius Caesar. The entire war and Julius Caesar’s intelligence and courage were made famous even as it was fought by that brilliant bit of self-serving propaganda, Caesar’s Gallic Wars. In 60 BCE, three men agreed to share control of Rome. These were Crassus, Pompey, and Julius Caesar. While theoretically equals, each strove to be the first among equals. Crassus was very rich. Yes, the old phrase “rich as Crassus” refers to him. Crassus had also proven himself a competent general by defeating Spartacus and his slave rebellion. Pompey also was a proven general, having won a number of victories in the name of Rome. The younger Julius Caesar had the greatest need to prove himself and the most to gain. So Crassus went off to Syria, where he managed to get himself killed while losing two entire legions to the Parthians. Pompey mostly stayed in Rome. He was already rich with the spoils of his earlier victories and had a great reputation. Caesar saw where the greatest opportunity was and chose to take over the province known as Transalpine Gaul. This was really the most northern parts of Italy and much of the south coast of France. This province gave him a base from which he could conquer the rich lands of the Gallic tribes. From 58 BCE until Alesia, Julius Caesar defeated one Gallic tribe after another. While not happy about the situation, no one tribe or local alliance could stand against his army of more than 50,000 highly trained legionnaires. It wasn’t until Julius Caesar was in northern Italy dealing with Roman politics that all the Gauls found themselves a leader. This was the charismatic and often brilliant Vercingetorix. Through strong oratory and good politics, Vercingetorix managed to get almost all the tribes in Gaul to swear to follow him into rebellion. That summer, the Gallic leader put tens of thousands of his warriors through a regimen of training. Then in the late fall, he led his army against the Roman garrison at Orleans (then called Cenabum). The city fell, thousands of Romans were killed, and Caesar suddenly had a major problem. His political strength came from being the conqueror of Gaul, and Gaul was looking very unconquered. To make things worse, Vercingetorix was a very good general, and he had chosen Orleans because the city was the main Roman grain storehouse. His army was now living off the Roman army’s supplies, and Caesar’s legions could expect short rations without them. In fact, Vercingetorix used food as a weapon throughout his rebellion, often effectively using scorched earth tactics against Caesar. Ironically, starvation would ultimately cause his surrender. Caesar rushed back to Gaul and united the legions that had been spread out in winter quarters. For the rest of the winter, Caesar either chased Vercingetorix or captured the cities that were in rebellion. After capturing Loire, today’s Paris, the Roman army turned toward the richest city still controlled by the rebelling tribes, Provence. Vercingetorix correctly guessed Caesar’s intentions, but the mistake he made was in how he reacted, and that reaction was what lost the war. To understand the mistake Vercingetorix made, you need to look at the strengths of the two sides. You have the Romans, who were technological, highly organized, and efficient at fortification and siege weapons. The Roman soldier was not individually a great warrior. He was smaller and shorter than most Gauls and carried a far shorter sword. One-on-one, the Gauls often won any fight. But the Romans never fought in a “heroic” manner involving individual duels. Fighting as part of the Roman legion, they could take on twice their number or more and be assured of victory. The Gallic warriors were a different breed. They were warriors and not soldiers. While Vercingetorix’s training had helped make them more effective as an army, personal heroics were still highly valued. They were not experienced at siege warfare, and while quite capable of building fortifications, they were not as adept in attacking or holding them. This is demonstrated by the number of Gallic cities that had fallen to Caesar that decade. The Gauls were masters at moving quickly and hitting hard. 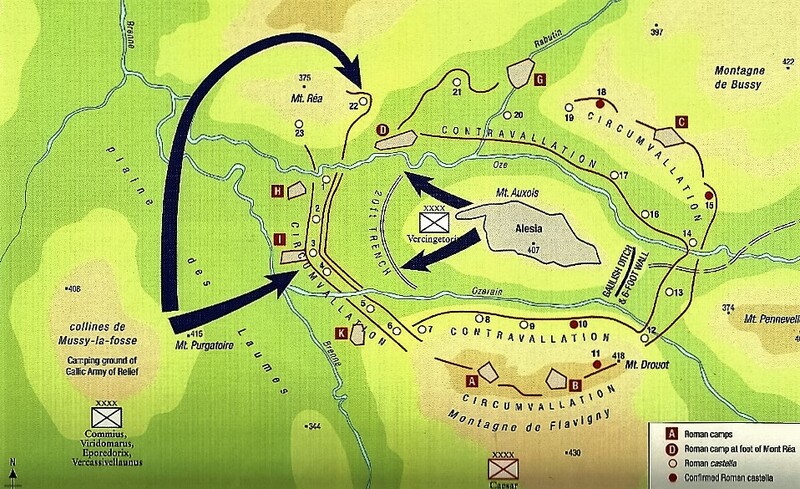 Knowing where Caesar was going and that he had an army about twice as large as the Romans’, Vercingetorix moved his army to a strategic point along the route to Provence. Then he made a move that almost ensured defeat. The city of Alesia had great natural defenses. It was set on steep cliffs with rivers on two sides. Vercingetorix knew that the Romans could not just bypass his army or it would attack them from the rear while they besieged Provence. So if they could not go past, he assumed they would have to stop and lay siege to his army, held up in what was perhaps the best defensive position in Gaul. What he did not realize was that by doing this, he was in a situation that played into just about every strength of the Romans, while neutralizing the personal courage and endurance that set apart his own forces. Julius Caesar did arrive at Alesia and found more than 100,000 Gauls entrenched in the city and ready to resist any attack by his 60,000 Romans, auxiliary, and German cavalry. He could not leave that large an army in his rear. Vercingetorix was right; Caesar could not continue to Provence. 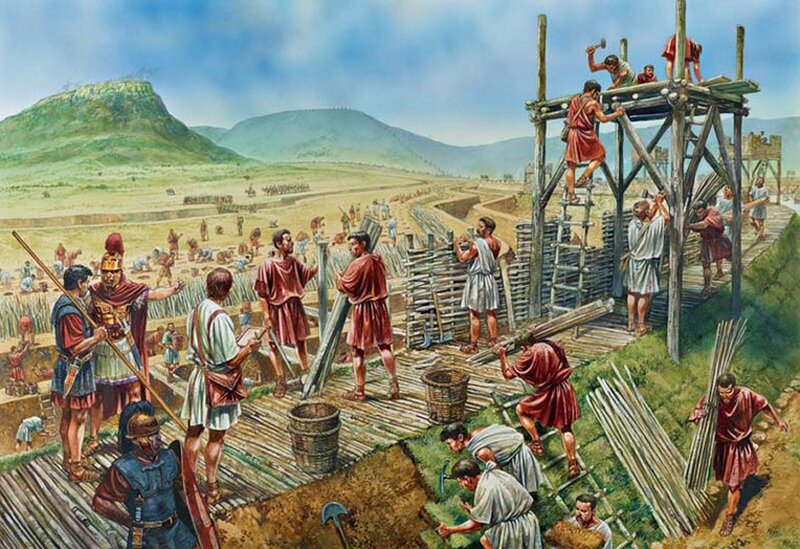 It was also obvious that attacking the high walls of Alesia with almost double their number in defenders behind them would have been suicidal for the Romans. So Caesar did not attack. Instead he ordered his army to begin building a wall around the entire city. Crossing two rivers and fronted by a twenty-foot-deep trench, Caesar’s inner wall ran for ten miles and completely cut off Alesia. There was a tower every 120 feet and all sorts of traps and sharp objects scattered in front of the wall that served to break up any Gallic attack. And the Roman legionnaires could dig. Every night they fortified their camps within walls made from stakes they carried on the march. The walls around Alesia soon proved as immune to attack as the walls of that city itself. So the Gauls waited vainly for a Roman attack that never came. By locking himself up in a city, Vercingetorix had managed to take a great field army and trap it inside Roman walls. He had turned it from a battle of swords and spears to one of shovels and picks. He had managed to put his larger army in a position in which they had to fight on Roman terms, and no one could dig, build, or defend any wall better than the Roman legionnaires. When it became obvious he was under siege and unable to break out, the Gallic leader sent out riders to summon all the warriors not trapped in Alesia to come to his relief. They got out just before the first wall was completed, but not without the Romans learning of their mission. Knowing that someday another army would most likely appear to relieve the siege of Alesia, Caesar ordered yet another wall built. This wall faced outward and ran for fourteen miles. By the time the relief army arrived, the second wall was finished. It all came down to a climactic battle fought among the Roman walls. 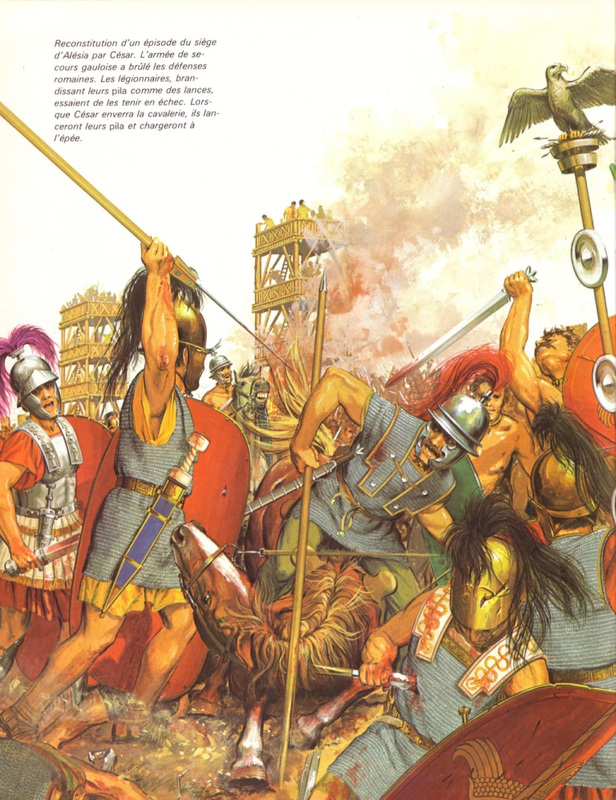 Vercingetorix also now had a serious problem: Inside Alesia they had run out of food. He had already driven out the women and children, whom Caesar refused to let pass out through his walls. So they starved, exposed just below the city’s walls and in sight of their husbands and fathers. The Gauls had to break through both walls and free Vercingetorix’s army or starvation alone would force it to surrender. Over 200,000 more Gauls, less well organized but ready to fight, appeared outside one section of the walls. The Romans were facing perhaps nearly 300,000 Gallic warriors inside and out with 40,000 legionnaires and 15,000 other auxiliaries, including 5,000 Germanic horsemen. They were outnumbered six to one, but they were fighting their kind of battle. The battle was fought on Roman terms and amid the Roman fortifications. Even so, the final confrontation at Alesia was a close thing and only a last-minute charge by the Germanic cavalry saved the day. The relief army was stopped, broken, and scattered. The men in Alesia remained trapped and starving. A few days later, Vercingetorix personally rode into the Roman camp and surrendered his army. His 90,000 warriors became slaves and never again did the Celts of Gaul resist rule by Rome. Vercingetorix made one mistake in an otherwise brilliant revolt. He voluntarily trapped his army inside Alesia in a position that played to the Romans’ strengths and nullified his own. Had Caesar attacked, the Romans would have suffered terrible casualties, but in war you should never assume the enemy will do what you want. Had the Gallic army of 300,000 warriors met Caesar in an open field, they might well have triumphed. If Vercingetorix had not made the mistake of locking his army inside Alesia, France, then the world today would have a lot more Gaul and a lot less Roman in it.